Department of Pharmacology, Institute of Medical Sciences, BHU, Varanasi-22105, Uttar Pradesh, INDIA. Molecular Bioprospection Department, CSIR-Central Institute of Medicinal and Aromatic Plants, Lucknow-226015, Uttar Pradesh, INDIA. Cognition impairment is the most recurrent form of dementia in aged people indicated by permanent neuronal loss and atypical behaviour. Disparities in cholinergic pathway have been reported as major cause of cognition impairment, where deficiency of acetylcholine occurs due to hydrolysis of acetylcholine by cholinesterases. Bombax ceiba (Bombacaceae) commonly known as silk cotton tree is an imperative plant of tropical and subtropical region which have been mentioned in the traditional systems of medicine. We have investigated the cholinesterase and antioxidant activity of B. ceiba extracts. Besides these activity evaluations, preliminary phytochemical testing and quantification of total phenolic and flavonoids have also been performed. Extracts from B. ceiba flowers in hexane and ethanol were prepared by cold maceration method. In vitro cholinesterase activity was estimated with the help of Ellman’s reagent, antioxidant potential of extracts was determined by well known method such as DPPH, FRAP, reducing power and total antioxidant power assay. Total phenolics and flavonoids were quantified by colorimetric method. Finding of present study indicated that B. ceiba extracts are rich in polyphenolic contents (19.10 ± 0.74 QcE and 28.01 ± 1.28 GaE). Results of antioxidative potential evaluation suggested that these extracts have high free radical scavenging potential (65.49 ± 2.49%) and are also able to reduce iron like radicals (93.78 FSE). Beside antioxidant potential B. ceiba extracts also inhibited the cholinesterase effectively (IC50 31.22 ± 1.42 µg/ml). Current investigation on B. ceiba flowers indicated that phenolic rich extracts could be used in development of effective plant-based cholinesterase inhibitors. Cognition impairment and Alzheimer (AD) disease is the mostly associated with frequent of dementia in older people evidenced by permanent neuronal loss and atypical behaviour.10 Imbalance in cholinergic pathway have been reported, where deficiency of acetylcholine (ACh) occur due to hydrolysis by acetylcholinesterase (AChE).11 Besides acetylcholinesterase, butyrylcholinesterase (BChE) also inactivate ACh as well as butyrylcholine (BCh), which is regarded as a new target in drug discovery for neurodegenerative diseases.12,13 Most of the currently approved drugs such as rivastigmine, donepezil and galantamine are acetylcholinesterase inhibitors whereas memantine is the NMDA antagonist.11 Plant and many natural derivative have already been reported for acetylcholinesterase (AChE) inhibitory activity elsewhere by many researchers in recent decade.14 AChE inhibitors have also been prescribed widely in many other physiological and pathological conditions such as myasthenia gravis, glaucoma, dementia, and Parkinson’s disease besides its application in to AD.15 In recent year many medicinal plant and natural products from various region of the Globe have been evaluated for their cholinesterase inhibitory activity, even though there is still a necessity for investigation for newer, potent, enduring and safer AChE inhibitors. Oxidative stresses take part in many neurological diseases; both acute and degenerative disorders are thought to involve free radical’s reactions in tissue injury. Oxidative stresses is also considered as imperative neurotoxic pathway in cognition impairment due to formation of harmful free radicals which may leads to neuronal damage and cell death.16 Antioxidant treatment has demonstrated in improvement of cognitive function and behavioural deficits in various animal models as well patients with mild to moderate AD.17 Recently discovered AChE inhibitor such as memoquin affects various other pathways by demonstrating antioxidant activities, put off αβ aggregation, persuading tau hyperphosphorylation and acting as β-secretase inhibitor.18 Plant drugs and natural products with antioxidant and cholinesterase inhibitory activity could be considered as useful prospecting candidate for development of new molecules against cognition impairment. In present investigation we are reporting the antioxidant and choline esterase inhibitory activity of phenolic rich extracts of Bombyx ceiba flowers. 2, 2-diphenyl-1-picrylhydrazyl (DPPH), folin reagent, sodium acetate quercetin, and ascorbic acid were purchased from Sigma Aldrich, India whereas dimethyl sulfoxide (DMSO), ferrous sulphate, sodium nitropruside dehydrate, Gallic acid, N-(1-naphthyl) ethylenediamine dihydrochloride, sulphanilamide, sodium carbonate, potassium ferricyanide, ferric chloride, tripyridyl-s-triazine (TPTZ), tris-[hydroxymethyl] amino methane, hydrogen phosphate were procured from Himedia Laboratories Mumbai, India. Flowers of Bombax ceiba were collected from BHU, Varanasi and authenticated by taxonomists of the Institute. Flowers were properly washed and dried (at 40°C in dryer). For the extraction dried flowers were powdered in an electric grinder, grounded material was dipped in hexane and ethanol successively, then it was filtered and evaporated to get viscous residue which were stored at 4°C for further evaluation. Total phenolics in B. ceiba extracts were quantified by the method described by Singleton and Rossi in (1965).20 The plant extracts (2, 10, 50, and 250 µg/mL) were taken and then folins reagent and 7.5 % sodium bicarbonate were mixed to it, the reaction cocktail was incubated at room temperature for 60 min. The Phenolic content was calculated, and results were expressed in terms of gallic acid equivalent/mg of extract (µg/mg of dried extracts) after taking absorbance at 760 nm against a reagent blank. Total flavonoids content in the B. ceiba extracts were estimated by colorimetric method.21 B. ceiba extracts (2, 10, 50, and 250 µg/mL) were taken, to it 10 μL of aluminum chloride, 150 μL of methanol, 1M potassium acetate and 280 µL of double distilled water were added. Total flavonoids content was estimated by measuring optical density at 420 nm against a blank. Results were expressed as quercetin equivalent/mg of extract (QcE µg/mg of dried extracts). DPPH radical scavenging assay is a commonly used method for the in vitro estimation of antioxidant potentials of extracts or molecules. DPPH characteristic deep purple colour bleaches on accepting hydrogen from a corresponding donor from plant extracts/phyto-molecules. The anti-oxidant potential of the different extracts of B. ceiba to scavenge DPPH radicals was assessed according to the method described by Chung et al. (2002) with some variations as earlier reported by Luqman et al. (2009).22,23 According to the described method, different concentrations of the samples (2, 10, 50, and 250 µg/ml) were added to 100 µl of methanol followed by 500 µl of tris-HCl buffer (pH 7.4) and 500 µl of the DPPH reagent. The reaction mixture was then incubated at 37ºC for 20 min in the dark and the absorbance was measured at 517 nm against a blank buffer and percent inhibition was calculated with respect to reagent control. Phytochemicals, which have ability to reduce iron like radicals react with potassium ferricyanide (Fe3+) to form potassium ferrocyanide (Fe2+) and form ferric-ferrous complex. 19,27 Various concentrations of samples (10, 25, 50 and 100 µg/mL) were pooled with phosphate buffer (200 mM, pH 6.6) and potassium ferricyanide. The mixture was incubated at 50ºC for 20 min. The supernatant was then transferred to microplate and to it distilled water and freshly prepared 0.10% FeCl3 were added and absorption was read at 700 nm against reagent blank. The estimation of the total antioxidant capacity (TAC) is based on method reported by Prieto et al. (1999).28 For the experiment different concentration of the extracts (10, 25, 50 and 100 µg/ml) were mixed with 1ml of the TAC reagent (600 mM ammonium molybdate, 250 mM phosphate monobasic and 600 mM concentrated sulphuric acid. The reaction mixture was heated on boiling water bath for 90 min. The optical density of the formed complex was noted at 695nm against a reagent blank and results were expressed as ascorbic acid equivalent. The hydrogen peroxide scavenging activity of samples was conducted following the procedure of Ruch et al.29 Hydrogen peroxide solution (2 mM) in 50 mM phosphate buffer having the pH of 7.4. Various plant samples having volume of 0.1 mL were taken in test tubes and their volumes were made 0.4 mL by addition of 50 mM phosphate buffer. Hydrogen peroxide solution (0.6 ml) was added to it and vortexed. After 10 min the absorbance of each sample was measured at 230 nm against the blank. Acetyl and butyl choline esterase activity of the extracts were evaluated according to standard method of method of Ellman and co-workers.25,26 Acetyl cholinesterase (Electric eel), butyrylcholinesterase (horse serum), acetylthiocholine iodide and butyrylthiocholine chloride, 5, 5´-Dithio-bis(2- nitrobenzoic) acid (Sigma Aldrich, India) were used for the measurement of the cholinesterase activity. In brief, 140 μL of 100 μM phosphate buffer (pH 8.0), 20 μl of 200 mM DTNB, 10 μl of extract and then 20 μl of 200 mM acetylcholinesterase/butyrylcholinesterase enzyme solution were put on to a flat bottom microplate and incubated for 20 min at 25ºC. The reaction was then started by the addition of 10 µL of 200 mM acetylthiocholine iodide/butyrylthiocholine chloride. The hydrolysis of acetylthiocholine iodide/butyrylthiocholine chloride was observed by the development of the light yellow 5-thio-2-nitrobenzoate anion. Optical density was observed at of 412 nm on microplate reader (Soft Max Pro, Molecular Devices, USA). Galanthamine, was used as reference drug. The values of experimental data are expressed as mean ± SD. One-way ANOVA (Dunnet test) was used to calculate significant level in Graph pad Instat, data with p value <0.05 were considered as significant. Qualitative preliminary phytochemical estimation was done by various standard methods and results are shown in Table 1. Hexane and ethanolic extracts of B. ceiba were found to contain various classes of phytochemicals such as alkaloids, terpenes, saponins, phenolics and flavnoids. Among all phytochemicals presence of phenolics and flavonoids were prominent. Results of phytochemicals estimation in B. ceiba extracts. The magnitude of total phenolics and flavonoids in the B. ceiba hexane and ethanolic extracts were investigated. In the present study B. ceiba extracts were found to contain high number of polyphenolic compounds indicated by presence of 19.10 ± 0.74 µg QcE/mg of dried extracts total flavonoids and 28.01 ± 1.28 µg GaE/mg of dried extracts total phenolics. Table 2 depicts total phenolics and flavonoids content. Total Flavonoids and Phenolic estimation@. @Value of total flavonoid and Phenolic contents are expressed as mean ± SD of three replicate of experiments. Hexane extract of B. ceiba was found to exhibit choline esterases more effectively than ethanolic extract, which was indicated by lower IC50 values as compared to ethanolic extract. Higher AChE and BChE inhibition were found in hexane extract i.e. 69.49 ± 0.66% and 60.49 ± 1.37% respectively. Findings of cholinesterase were significantly comparable with standard drug Galantamine. Results are shown in Table 3. * All values are expressed as mean ± SD (n = 3). Significant difference (p < 0.05) was observed with respect to control group for hexane extract at higher concentration 250 µg/mL; @ highest concentration for reference control was 100 µg/mL. As it has been evidenced that oxidative stress leads to cognition impairment, flower extracts were evaluated for their antioxidative potential. 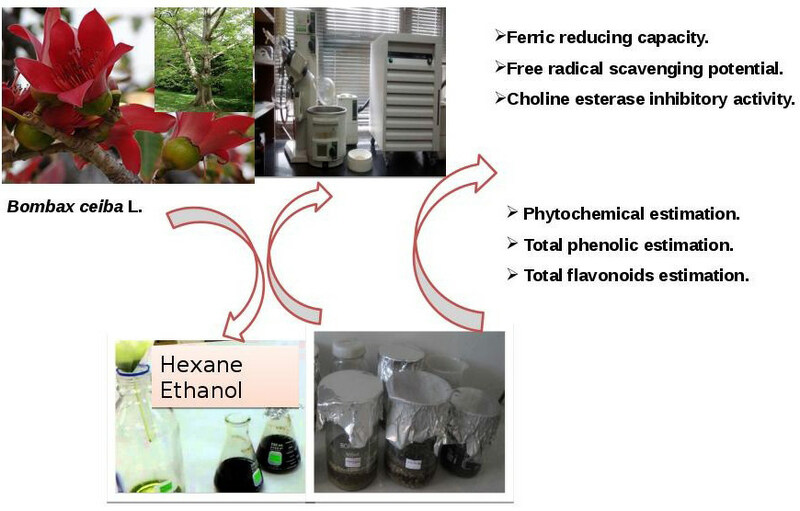 Findings of present study indicated that hexane extract of B. ceiba inhibited free radical generation more effectively than ethanol extract; results are depicted in Figure 1 and 2 respectively. Total antioxidant capacity and ferric reducing capacity of ethanolic extract was found better as compared to hexane extract, Figure 3 and 4 respectively. It was also observed that free radical and antioxidant activity of B. ceiba extract was comparable with lower concentration (10µg/ml) of reference control. All values are expressed as mean ± SD (n = 3). Significant difference (p < 0.05) was observed with respect to reference control group at higher concentration 250µg/mL; @ highest concentration for positive control was 100 µg/mL.1: Hexane extract; 2: Ethanol extract of B. ceiba; 3: Reference control (ascorbic acid). Ferrous reducing antioxidant power (FRAP). Total polyphenolic content in the B. ceiba hexane and ethanolic extracts were estimated using microplate assay method. Many phenolic compounds have been reported for the antioxidant activity of plant extract 19,27,30 and therefore natural polyphenols possess therapeutic potential for cognition impairment. Cholinesterases (ChE) are key enzyme in the cholinergic nervous system. Now a day’s therapies are being designed to modulate the cholinergic discrepancy in AD which mostly acts by inhibiting cholinesterases leading to cholinergic transmission with modest and transient therapeutic effects.31 Many recent investigations revealed that cholinesterase inhibitors could act on multiple therapeutic targets such as prevention of the formation of β-amyloid plaques, antioxidant activity and modulation of advance protein products. However, there is still necessitating for new cholinesterase inhibitor with better safety profile and higher central nervous system (CNS) penetration. Many plant based extracts and molecules have been investigated by bioassay-guided approaches for the identification of new cholinesterase inhibitors.31 Hydrolysis of AchE and BchE by cholinesterase’s are major problem in cognition impairments, therefore inhibition of esterases by plant extracts can be good strategy in search of safe drug. Present investigation can conclude that hexane and ethanolic extracts from B. ceiba flowers have high phenolic extracts that may be responsible for antioxidant and cholinesterase inhibitory properties. Further study on chemical characterization of extracts and in vivo efficacy evaluation is needed. Cognition impairment is the most recurrent form of dementia in aged people indicated by permanent neuronal loss. Oxidative stress in brain leads to cognitive impairment due to the formation of harmful free radicals which may cause neuronal damage and cell death. Disparities in cholinergic pathway lead to deficiency of acetylcholine due to hydrolysis of acetylcholine by acetyl/butyryl-cholinesterase. Plant drugs and natural products with antioxidant and cholinesterase inhibitory activity are considered as useful prospecting candidate for development of new molecules against cognition impairment. In the present investigation we have investigated the choline esterase and antioxidant activity of B. ceiba flowers extracts by biochemical assay. Hexane and ethanol extracts were prepared by maceration method. Antioxidant potential was estimated by in vitro biochemical method. Anti-cholinesterase activity was estimated by Ellman method with the help of spectrophotometre. Present investigation can conclude that hexane and ethanolic extracts from B. ceiba flowers have high phenolic content that may be responsible for antioxidant and choline esterase inhibitory properties. Cite this article: Sinha S, Kumar B, Singh DK, Luqman S, Singh M, Singh A. Antioxidant and Choline Esterase Inhibitory Activity of Phenolic Rich Extracts from Bombax ceiba L. Flowers. Free Radicals and Antioxidants. 2018;8(2):135-40.